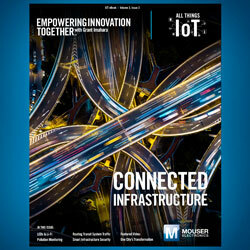 Mouser has released a new eBook focused on industrial automation as part of All Things IoT, the latest series in their award-winning Empowering Innovation Together program. In the third and final eBook in the series, industry experts investigate the innovative technologies and trends that cities are implementing to emerging smart infrastructure projects. The book covers articles on LEDs and light fidelity (Li-Fi) lighting systems, threat modelling, and IoT)-based pollution control. The new release also incorporates an exclusive video of celebrity engineer and company spokesperson Grant Imahara in Porto, Portugal, to learn more about a regional company that is transforming the city into a Wi-Fi mesh network comprising of mobile hotspots. The series is sponsored by the company’s valued suppliers Digi International, Maxim Integrated, Murata and TE Connectivity.